Notions description...NOTIONS: Headpiece A: One 21/2" Comb, Wire, First Aid Tape, Needle Nose Pliers, 1/2 yd. of 3/4" Lace Trim, 1/2 yd. of 2mm Pearls By the Yard, Sequins, 2mm Pearls, Quilting Thread and Bridal Glue. 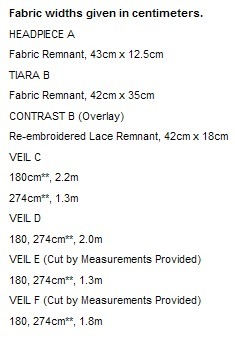 Tiara B: Purchased Tiara Frame, Two 1" Combs, Needle Nose Pliers, Wire Cutter, First Aid Tape, 1 yd. of 2mm Pearls By the Yard, Sequins, Sew-on Rhinestones, 2mm Pearls, Silver Seed Beads, Quilting Thread, 1/8 yd. 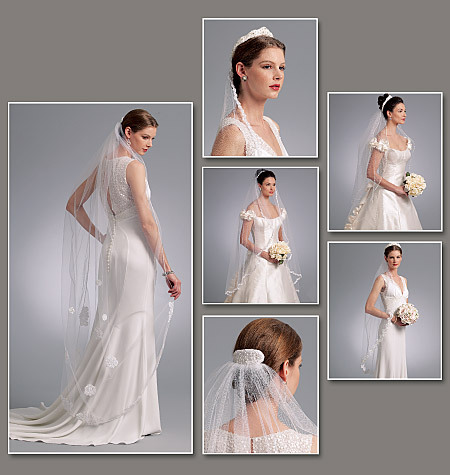 of Bridal Elastic Button Loop and Bridal Glue. Veil C: One 3" Comb, 63/4 yds. of 1/8" Soutache Braid, 1/8 yd. of 1" Organza Ribbon, Quilting Thread and Invisible Thread. Veil D: One 3" Comb and 61/4 yds. of 3/4" Lace Trim. Veil E: One 3" Comb, 1/8 yd. of 1" Organza Ribbon, 11/2 yds. of 1/8" Soutache Braid, 21/2 yds. of 21/4" Lace Trim, Bridal Glue, Quilting Thread and Invisible Thread. Veil F: One 41/2" Comb, 1 yd. of 3" Bridal Lace, 1/4 yd. of 1" Organza Ribbon, 47/8 yds. of 2mm Pearls By the Yard, Quilting Thread and Invisible Thread.